This is a super easy sauce to make, and it can be a delicious finishing touch for simple baked, grilled, or broiled fish, shrimp, or chicken. It is an excellent sauce to use to gussy up plain sauteed turkey cutlets or baked chicken breasts or drizzle it over baked salmon or tuna fillets. The sauce goes well with veal, too. The recipe makes enough sauce for about four generous servings, and it can be scaled up easily for more. Drain and rinse the capers. If they are large, chop them coarsely. Melt the butter in a small skillet or sauté pan over low heat. Add the minced garlic, lemon juice, lemon zest, and capers. Bring to a simmer and continue cooking over low heat for about 30 seconds. Add the chopped fresh parsley; stir and remove from the heat. Drizzle the warm sauce over cooked fish, chicken, or turkey cutlets, and serve immediately. Saute 1 tablespoon of minced shallots in the butter until they are translucent. Add the minced garlic and continue with the recipe. 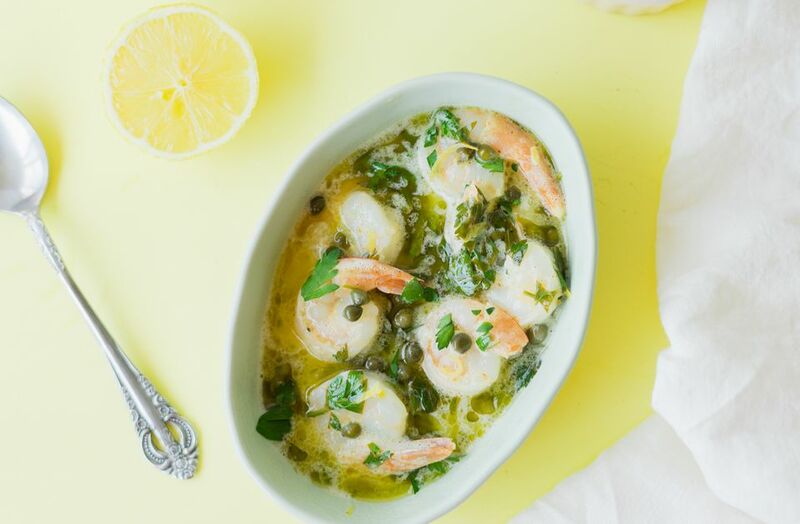 To double the recipe, use 1 1/2 tablespoons of capers, 6 tablespoons of butter, 1 large clove of garlic, 1/4 cup of lemon juice, and 2 teaspoons of lemon zest.